CAMBRIDGE, MA) -- The biggest drawback to many real or proposed sources of clean, renewable energy is their intermittency: The wind doesn’t always blow, the sun doesn’t always shine, and so the power they produce may not be available at the times it’s needed. A major goal of energy research has been to find ways to help smooth out these erratic supplies. New results from an ongoing research program at MIT, reported in the Journal of the American Chemical Society, show a promising technology that could provide that long-sought way of leveling the load — at far lower cost and with greater longevity than previous methods. The system uses high-temperature batteries whose liquid components, like some novelty cocktails, naturally settle into distinct layers because of their different densities. The three molten materials form the positive and negative poles of the battery, as well as a layer of electrolyte — a material that charged particles cross through as the battery is being charged or discharged — in between. All three layers are composed of materials that are abundant and inexpensive, explains Donald Sadoway, the John F. Elliott Professor of Materials Chemistry at MIT and the senior author of the new paper. “We explored many chemistries,” Sadoway says, looking for the right combination of electrical properties, abundant availability and differences in density that would allow the layers to remain separate. 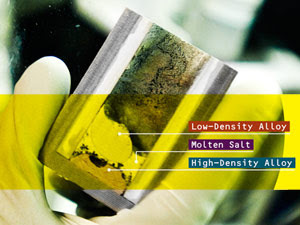 His team has found a number of promising candidates, he says, and is publishing their detailed analysis of one such combination: magnesium for the negative electrode (top layer), a salt mixture containing magnesium chloride for the electrolyte (middle layer) and antimony for the positive electrode (bottom layer). The system would operate at a temperature of 700 degrees Celsius, or 1,292 degrees Fahrenheit. In this formulation, Sadoway explains, the battery delivers current as magnesium atoms lose two electrons, becoming magnesium ions that migrate through the electrolyte to the other electrode. There, they reacquire two electrons and revert to ordinary magnesium atoms, which form an alloy with the antimony. 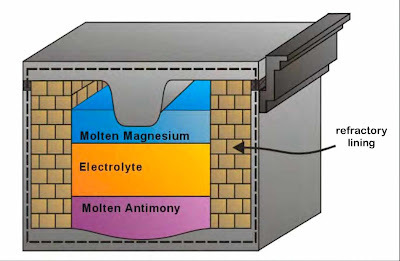 To recharge, the battery is connected to a source of electricity, which drives magnesium out of the alloy and across the electrolyte, where it then rejoins the negative electrode. Over the last three years, Sadoway and his team — including graduate student David Bradwell, the lead author of the new paper — have gradually scaled up their experiments. Their initial tests used batteries the size of a shot glass; they then progressed to cells the size of a hockey puck, three inches in diameter and an inch thick. Now, they have started tests on a six-inch-wide version, with 200 times the power-storage capacity of the initial version. The team is continuing to work on optimizing all aspects of the system, including the containers used to hold the molten materials and the ways of insulating and heating them, as well as ways of reducing the operating temperature to help cut energy costs. “We’ve discovered ways to decrease the operating temperature without sacrificing electrical performance or cost,” Sadoway says. Sadoway, along with Bradwell, has founded a company to bring this technology to commercialization, and is on sabbatical this year working with the company, Liquid Metal Battery Corp. “If this technology succeeds,” he says, “it could be a game-changer” for renewable energy.